At FitMe Wellness, members are invited to find their fit. This philosophy toward health and wellness recognizes that while our paths will often cross and/or parallel one another, every member has a separate path to better health. Our Member Spotlight feature seeks to bring to you stories of how FitMe members have found their fit in the hopes that it will inspire you on your own path to health and wellness. You will ideally see bits and pieces of yourself in FitMe members’ stories. At first glance, you might not be able to see what you have in common with someone. We all, however, tend to struggle with similar issues when it comes to living healthier lives. In this issue, we’re excited to introduce you to Jim, who has been a member at FitMe Wellness for the past two years. He made fitness a priority after battling cancer. After enjoying success on his own, he’s taking it to the next level with one of FitMe’s personal trainers, Ryan Hoskinson. Q: Tell me about your decision-making process in joining FitMe back in January 2016. I joined FitMe Wellness at the age of 43 after a battle with a year-and-a-half-long health issue with the intentions of losing weight and getting back into a good state of health. I had never experienced any previous health-related issues, and naturally when you don’t have those experiences you always believe you’re invincible. I was always a “big” guy growing up; I played football and baseball and was always a pretty athletic person. In my twenties, I joined Peak and started weightlifting with the natural intent of getting bigger and stronger. I was lucky in the fact that I was seeing results from working out and went regularly. After Peak I decided to join Champions Gym as I believed it was more geared towards my desire to lift weights rather than seeking all-around fitness. Heading into my thirties, I got “comfortable” and lazy, letting myself go and concentrating more on my career than my health and fitness. Eating more, working out less and living life large was the norm. At that time, I was drifting between 250 and 260 pounds. I never looked “fat,” just deemed a big, solid guy. No matter what I did and what I ate, my weight did not vary much from my late twenties on. I was comfortable, living a good life with no worries in the world. Then in late 2013 to early 2014, I started having some worrisome symptoms. My doctors discovered that I had stage 3 colon cancer in March 2014. The rest of that year I battled the disease and finished the year with two major surgeries. I maintained a very positive “attack” type attitude throughout my treatments and surgeries which helped me to fight and recover quickly. By March 2015, I was declared cancer-free and happy to be alive. I had lost 30 pounds that year, but not for a good reason! Anyone familiar with cancer knows it beats you down and that you typically lose weight and strength. For the rest of 2015, I relished in the fact that I had a second lease on life and I lived it as best I could. I was able to gain the weight back by living my life and just being happy. In January 2016, I decided to take my life back and began researching local gyms and fitness clubs. Now in my forties with a hard-earned perspective on life, I was looking for a place that would allow me to make an efficient use of my time and that was focused on my health, instead of a place to be “seen” and to absentmindedly occupy a weight bench while I posted a picture of myself to Snapchat. I researched a handful of local establishments until a friend mentioned FitMe. I decided to go check it out one morning and between the place, people and, most of all, the positive attitudes, my decision was instantly made that this was the place for me. Q: You told me that you’ve lost about 60 pounds since you’ve been a member. Could you tell us what changes you’ve made that you feel have contributed to your weight loss? Joining FitMe was one of the best decisions I could have made. Things started out slowly; I didn’t really know what I was doing, other than just the basics, but I had a positive attitude and I was determined to not get intimidated or give up. I would ask the FitMe staff questions on occasion or watch what others were doing and just started experimenting on my own. As time went on, I started developing a routine and regularly attended the gym three to four times a week. I was never a “healthy” eater. I ate what I wanted to, when I wanted to. My weight never fluctuated beyond a 10-pound range regardless of what or how I ate, but I knew that I had to make a change. After starting to work out again, I began to watch what I ate on a daily basis. I didn’t know nutrition very well at the time or count calories; I just used common sense and told myself that my daily diet had to have balance. For example, if I had a healthy lunch, then I would maybe cheat a little for dinner or vice versa. It wasn’t the most scientific approach, but it worked for me. I steadily saw the weight drop over the course of the next year. My original goal was to get to 225 pounds. Sticking to my plan, I lost 56 pounds over the course of a year and a half, with 204 being my lightest. People noticed my weight loss and overall I was beyond ecstatic with my results. But I didn’t stop there. I decided that I wanted to take my workouts to another level with the help of a personal trainer and thought Ryan Hoskinson, one of FitMe’s personal trainers, was the best fit for me. I had started to hit a wall with my workouts and hoped to see more muscle definition to go along with my weight loss results. My decision to choose Ryan was based on his attitude, know-how and how he truly cares about his clients. He cares about his clients’ lives, their lifestyles and helping them reach and blow past their goals. We started out talking, then working. We continue to talk about the next steps and what my goals are. I am lucky in the fact that I met an amazing woman who better understands nutrition than I do; she has been integral in my improved eating habits, better food choices, and motivating me to make the right choices. She has incorporated meal plans into my daily routine, chooses the right ingredients when we do eat at home, and is an overall boost to everything I do. Having support from your loved ones is so important to making changes in your life; she is the best partner I could ask for and genuinely cares about my goals and results. My next goal is to continue to get into better shape while working on sculpting my body into something better. I can see and feel the results from working with Ryan. He pushes me (and I push back!) but we have a great understanding of each other and a great working relationship. My weight is up around the 215 mark recently and that’s thanks to gains in muscle weight. At 46, I feel and look better than I ever have in my life. It was never easy, but it’s worth the hard work. Q: I assume you’ve tried other health clubs in the area. Can you discuss in what ways you feel FitMe sets itself apart from the rest? FitMe immediately appealed to me from the moment I stepped in the door. 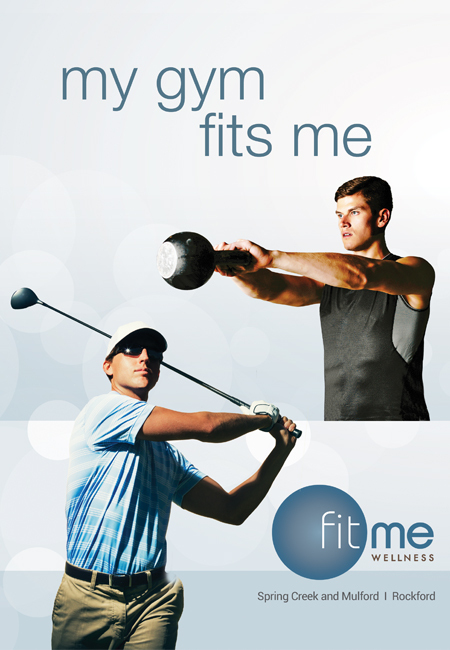 Tom Craig [FitMe’s Director of Member Sales] was integral in my immediate comfort and positive attitude towards FitMe. There is a wide range of members in various ages and physical conditions; the common thread is that they are all there to improve their health. I have never felt judged or thought anyone was trying to pass judgment on me. People do socialize but not the way I’ve witnessed at other local gyms or health clubs. They are there for a purpose. I’ve witnessed people at other clubs who barely work out and are more concerned with their cell phones; ten minutes of phone time to one minute of work qualifies as “I went to the gym today” for them. FitMe has a real sense of community, almost like a family. The staff really makes an effort to get to know you if you let them. Greg Georgis, FitMe’s owner, engages with the members and cares about his staff. That’s the kind of place I enjoy going to and I’ve made many friends along the way. I’ve enjoyed my time so much that I have referred a handful of friends that have joined and are very happy with their decisions. FitMe is definitely the right fit for me. Q: What value do you feel Ryan has added to your fitness regimen? Ryan took the time to sit and talk first. He wanted to know where I came from, where I was going and how I wanted to get there. He took genuine concern in what was important to me rather than just running me through a pre-packaged, stereotypical routine that a trainer might run all their clients through. Ryan was honest and forthcoming from the beginning. In addition to his genuine concern for me and my goals, he didn’t just tell you to do an exercise, he explained what muscles we were working and why each exercise was part of the workout. He put genuine thought into a plan that was unique to me. Now we are incorporating nutrition and meal plans into my fitness regimen which I fully believe will take me to the next level. Q: Knowing what you do now, do you wish you had started working out with a personal trainer earlier, notwithstanding your weight-loss success? Yes, I do. If I had started to work with a trainer earlier, I would definitely be further along in my transformation. There are many times that I just don’t push myself as hard as I know I could, or when I don’t even feel like going to the gym. Whether it’s a bad day at work, a personal issue at home, or anything in-between, you just don’t feel like going to the gym sometimes. Working with Ryan guarantees that not only will I go, but I’ll work harder under his amazing motivation and feel great when I’m done. Ryan has developed a written plan for me for when we train together, but also for when I work out on my own. I’ve also learned so much about the different muscle groups, what they do and how to work them more effectively. Everyone has witnessed the people in the gym trying to lift heavy weights, using poor form or just flat-out doing it wrong. I’ve realized how much more effective using the correct form with the right amount of weight is; I’ve had much better workouts working with Ryan using less weight, better form and better range of motion with resistance.